During this time of year, as joyful as the holidays are, there are shopping frenzies, and elevated stress about what to buy who, and where to buy what. I tend to avoid the pandemonium, reaching out in other ways to my loved ones. However this year, I have pledged to shop at local, independent businesses to help boost our local economy and mindfully select unique, well-crafted and memorable gifts. You can bet one of my local purchases will be from Seattle’s premier chocolate shop, Chocolopolis. Full to the rim with only the finest, most ethically made bars, this is the store to visit if you want to gift your loved ones with a delicious experience. Consuming good chocolate really is an experience, if done right and presented in the right manner. So read on to learn more about the particulars of concocting one. 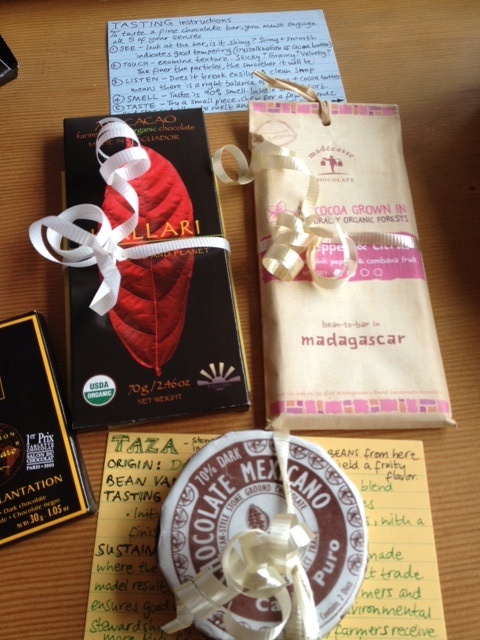 Recently, a friend of mine asked me to put together a “chocolate experience” gift package for her sister’s birthday. “You know which bars are good, you taught me about how to taste a chocolate bar properly, you should do this!” And so I did. Alternatively, here is a list of some amazing bars I’ve tried, made with such care you can’t help but feel blessed to be able to take a bite. I’ve included tasting instructions, price ranges, and what to look for when buying a bar. I hope you pause to consider buying a bar or two for you and your loved ones, to support small businesses, and to support the art of fine chocolate making. 1. Look at the bar. Is it shiny? Pale? (Ideally you want a very shiny, glossy surface). 2. Touch. Is it smooth? Gritty? (Generally a smooth surface is preferred, the exception being a Taza type of bar). 3. Listen. Break a piece off . Was it a clean snap? (A yes indicates expert melding of the cacao butter and cacao liqueur). 4. Smell. I like to rub my thumb on the piece of chocolate (about the size of one segment of a finger) to help release the aromas. What do you smell? Close your eyes and absorb it. Taste is 90% smell. Eventually, with practice, you may be able to smell more than “chocolate.” I practice by smelling my fruits, flowers, soil, spices. 5. Taste. Pop the piece of chocolate in your mouth, bite a few times to break it up, and then, just refrain from chewing it all and please, let it melt. Slowly. Let it spread everywhere and notice any changes in flavor (if you go darker, and pay a bit more, you will taste so much more than sugar). The taste of a good chocolate will linger for many seconds after you eat it. When you’re shopping for a bar, look at the ingredients! There should be no more than 4-5 (some of the more expensive bars will only have 2). Emulsifiers are not necessary, and oils certainly have no place. Every ingredient should be familiar. Look for simplicity and purity. Certifications – there are many certifications popping up. Stick with Fair Trade, Fair for Life, Rainforest Alliance, USDA organic. I think UTZ is also credible and I look forward to exploring other certifications. NOT all bars will have certification. Don’t dismiss it straight away (e.g. Grenada chocolate) – read the back – is there a story about the company’s practices? Again, look at the ingredients. Look at whether the country of the bean’s origin is mentioned. There are many bean varietals but the main ones are Forastero, Criollo and Trinitario. Look for the latter two (mostly used in artisanal bars). Not all bars have this information. Sometimes the packaging speaks for itself (like Madecasse, Askinosie, Rogue) but don’t just go by a pretty cover. Pry a little. Heck, google the company while you’re at the store if you are so compelled. $4 to $6 – all these companies aim to pay farmers a fair wage and produce a high quality bar with minimal ingredients (4-5) and have legitimate certifications. Some bars are made in the country of origin (where the beans are sourced for), allowing for arguably more benefits to the local communities and farmers. Theo – Multiple flavors available. The dark chocolate with salted almonds is one of my favorites. Fair for Life certification. Kallari – Very smooth. Kallari produces their chocolate in Ecuador. Rainforest Alliance certified. Madecasse – I’m partial to the 75% plain. They have some fun flavors. Made in Madagascar. Taza – Stone ground and direct trade. Very interesting texture. Grenada Chocolate Company – Made in Grenada, organic. $7 to $10 – Many of these bars only have 2 ingredients: high quality cocoa beans and sugar. The result is spectacular. I’ve bought some of the bars below in the past for over $10 but prices have come down since. Madre – Beans from Hawaii, chocolate is made in Hawaii – the only place in the U.S. where cacao can grow. Happy exploration! Most of these bars can be found in specialty stores, or natural food markets, and online. Thanks M! Yes, visiting Madre is on my list! We should start planning in 2013.